Between all these working days that fly by too fast, life happens. 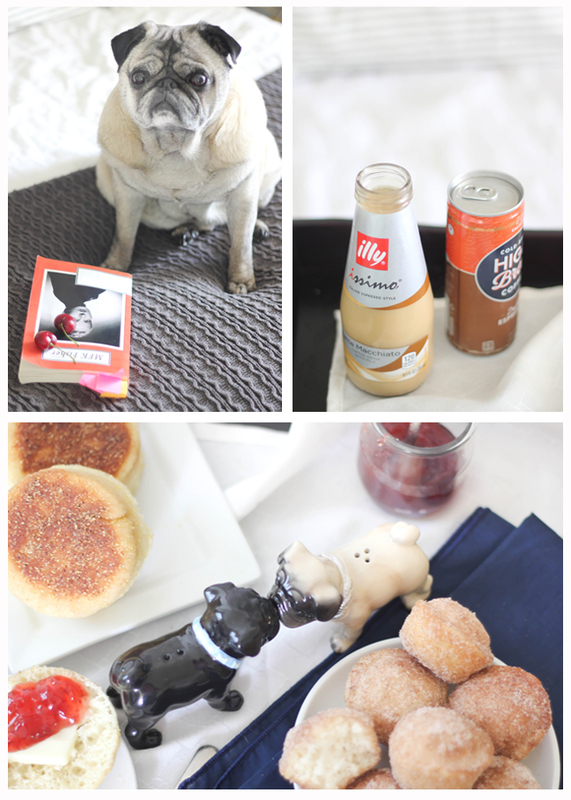 My husband had a birthday yesterday, and even though there are cookbook sweets all over the house (on every flat surface and some balanced precariously on chair arms) I was determined to make him something special. This was my first time making Magic Flan Cake, and let me tell you this: it is special. It may not win any beauty contests, but it's the kind of cake that makes you close your eyes after you taste it. And the magic part? That takes place in the oven. The cake batter get poured into the pan first, and then the flan mixture is poured on top of the batter. During baking the two switch places- pretty neat! 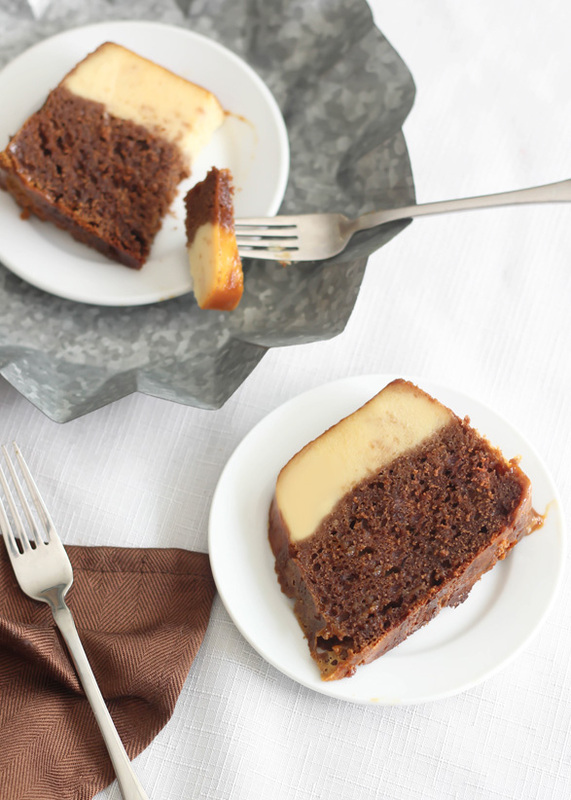 My favorite part is how the flan infuses the cake batter with creamy goodness, so the whole thing is a glorious custard/pudding/cake masterpiece. There are two important things you need to know about this cake. (1. start one day ahead, the cake needs to chill in the refrigerator 8 hours or overnight, and (2. it requires a water bath. That might sound like a lot of work, but it's worth it. I repeat - It's SO worth it! Spray a 12-cup bundt pan with flour-based baking spray (such as Baker’s Joy). Pour the caramel sauce evenly into the bottom of the pan. In a medium bowl, combine the flour, cocoa, cinnamon, baking soda, and salt; set aside. In a microwave-safe bowl, combine the chocolate and butter; heat at 30 second increments in the microwave, stirring between heating until smooth. Add the buttermilk, sugar, eggs, and vanilla to the melted chocolate mixture and whisk until incorporated. Add the flour mixture and stir until combined. Pour the chocolate batter evenly over the caramel in the pan. 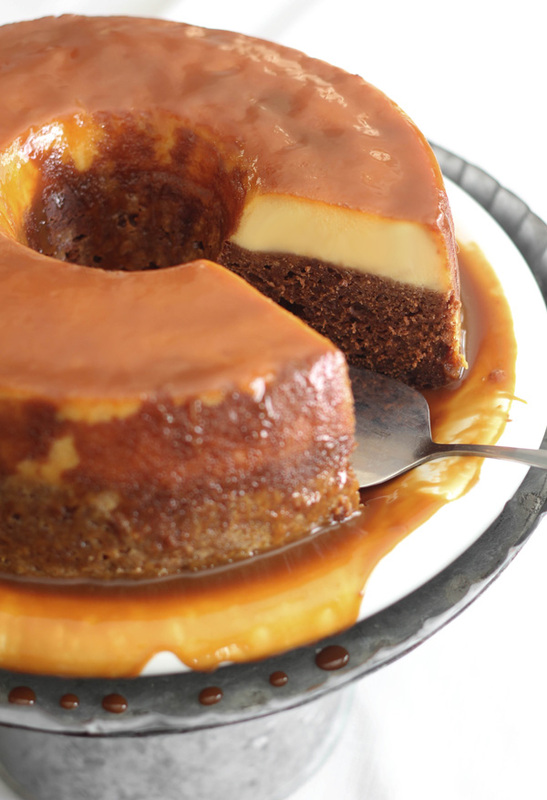 Add all the flan ingredients to a blender pitcher and process on liquefy (high) until smooth. Slowly pour the flan mixture over the cake batter. Place the cake pan in a large roasting pan and then place it in the oven. Carefully pour hot water into the roasting pan (I used hot water straight from the tap) until it reaches halfway up the sides of the bundt pan. Bake the cake for 80 to 90 minutes, or until a toothpick tester comes out with a few moist crumbs clinging (mine took about 1 hour 40 minutes). Gently remove the Bundt pan from the roasting pan and place it on a cooling rack. Allow it to cool completely in the pan. Refrigerate the cake in the pan for 8 hours, or overnight. 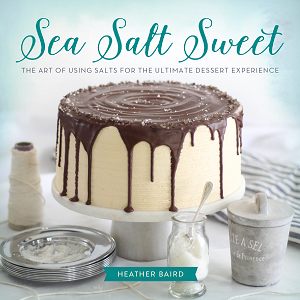 To unmold the cake, fill a large bowl (or your sink) with hot water. 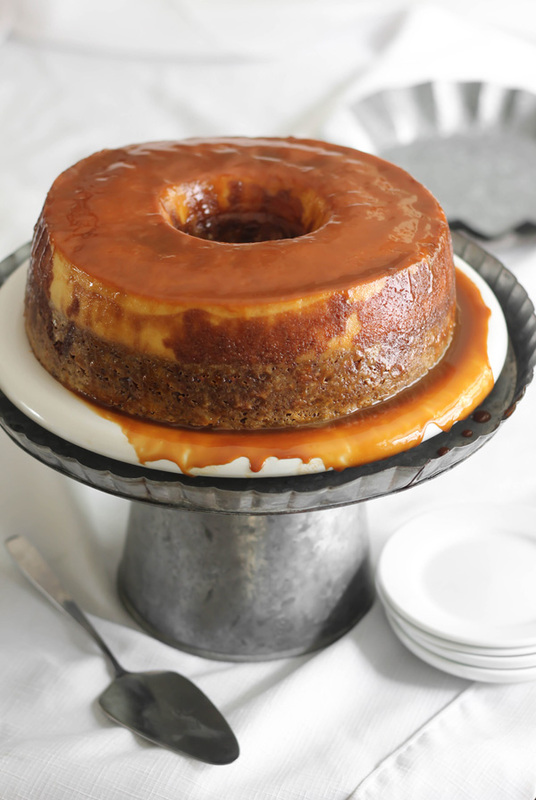 Place the bottom of the cake pan in the water to warm the caramel/flan portion of the cake. This will help the cake release. 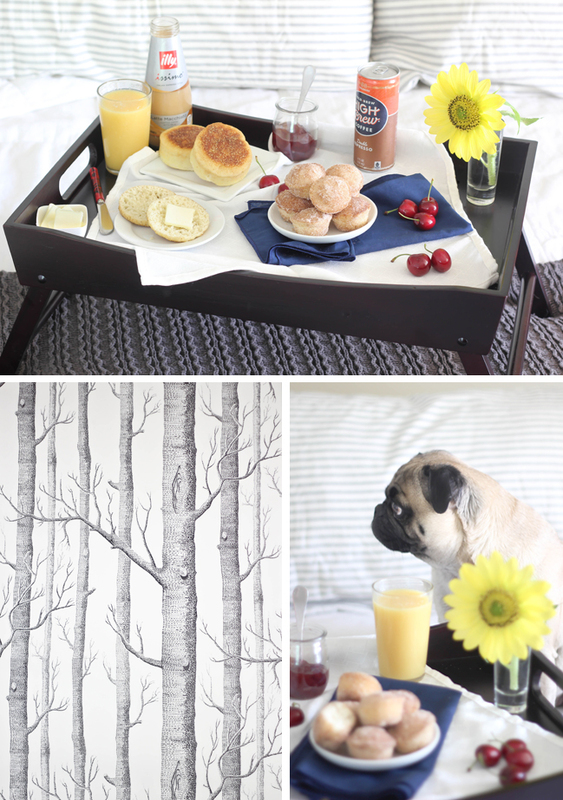 Turn the cake out onto a large serving platter or a cake stand that has a lip. 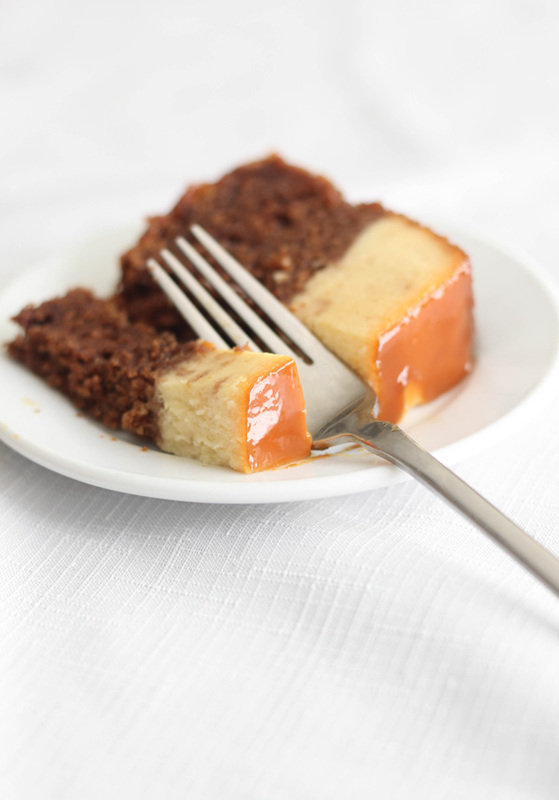 The caramel will drizzle down over the cake as you remove the pan. Store the cake covered in plastic wrap in the refrigerator. I'm not in the business of making wedding cakes, nor do I want to be, but I make exceptions for family and close friends. Clearly, there's a lot of pressure involved, and my hat goes off to anyone who chooses this as an occupation. Any cake that is served to a large group of people should always be the perfect trifecta of beauty, flavor and texture, and I still feel like I'm learning to master all of those elements. That's why I'm amazed that anyone would trust me with their most memorable cake, but alas, earlier this year I was asked, and I said yes because I love my family. I reasoned that even if it was an epic failure, everything would be okay because my family is still obligated to love me. 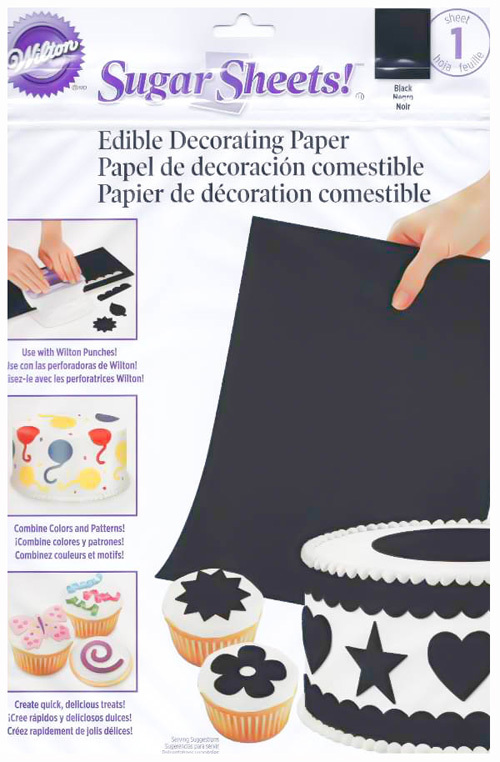 When I learned of this new project, I turned to my friends at Wilton. They gave me some great products to work with, and I'm not sure how this cake would have turned out without them. 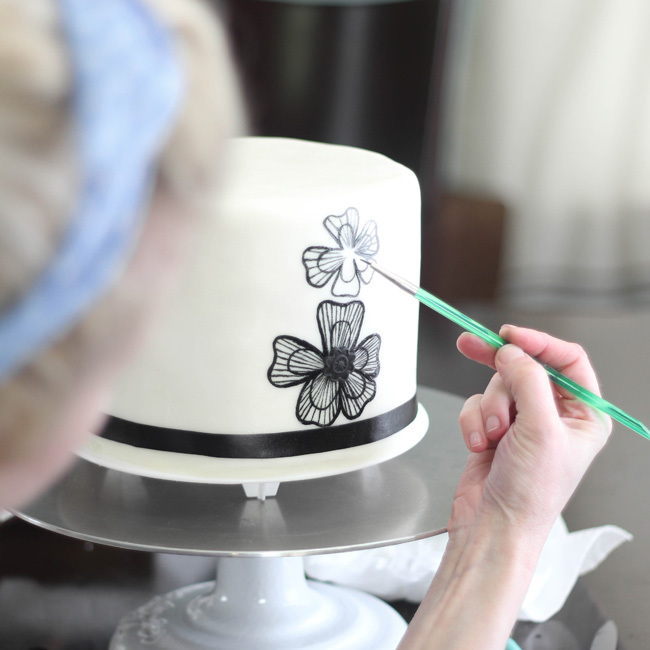 The cake's design is very simple, but that means the few embellishments on the cake needed to be well executed. 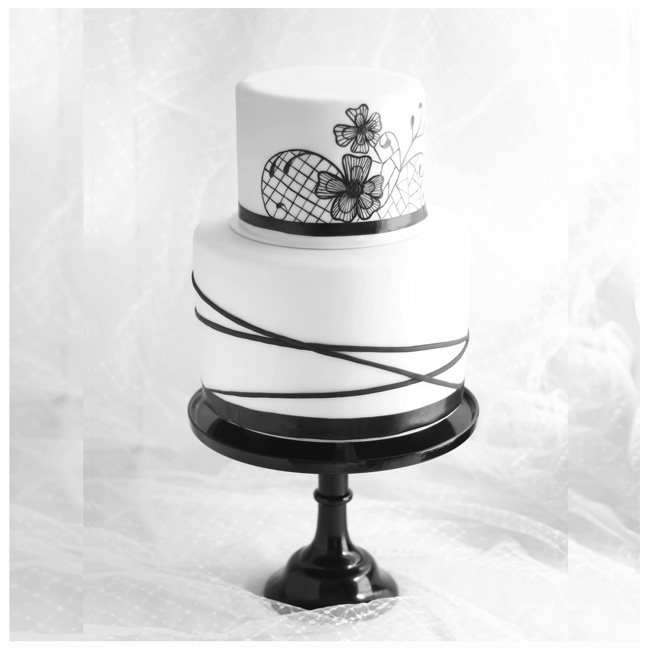 The black ribbon around the bottom of the cake is cut from Wilton Sugar Sheets. I tried using fondant for this at first, but I could never make it look as uniform as it needed to be. The Sugar Sheets turned out to be a life saver! They are as easy to cut as regular paper (with kitchen-dedicated scissors, of course) and gave the cake a crisp black edge. Plus, it had none of the metallic taste that is associated with black food color. I am a fan! Another tool Wilton sent was the Lace Fondant and Gum Paste Mold. The bride picked out a specific floral design that I hand painted on the cake, but when I finished painting the first flower, I felt it needed a little something extra. I made the flower centers with black fondant and the gum paste mold. I know it looks subtle, but it really made the finished cake look polished. 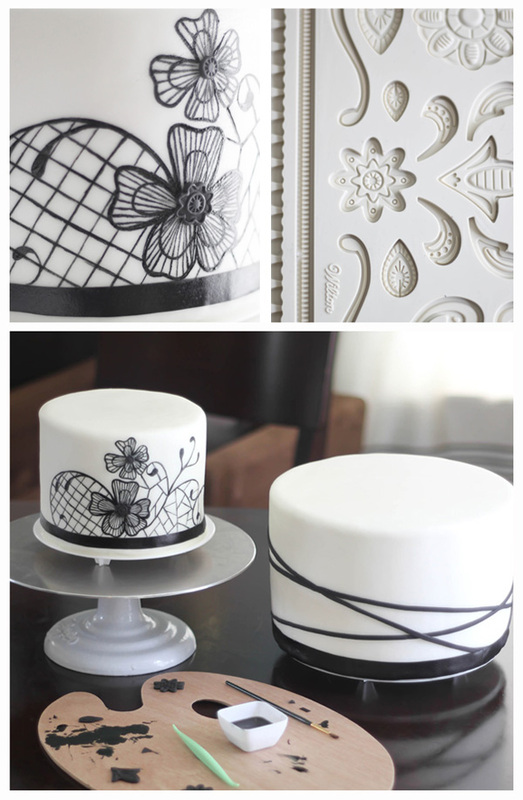 The black crossed lines on the bottom tier are made with black fondant, and boy, were those ever difficult to get right! Maybe someday I'll dedicate an entire post and video tutorial on how to create the effect. It sure is pretty but I spent several hours measuring, moving, straightening, fixing - repeat, repeat, repeat! Speaking of tutorials. I decided to make a video on how to achieve smooth buttercream frosting on a cake, specifically for cakes that will be covered in fondant. Once upon a time I applied a measly thin coat of buttercream, but have since seen the err of my ways. 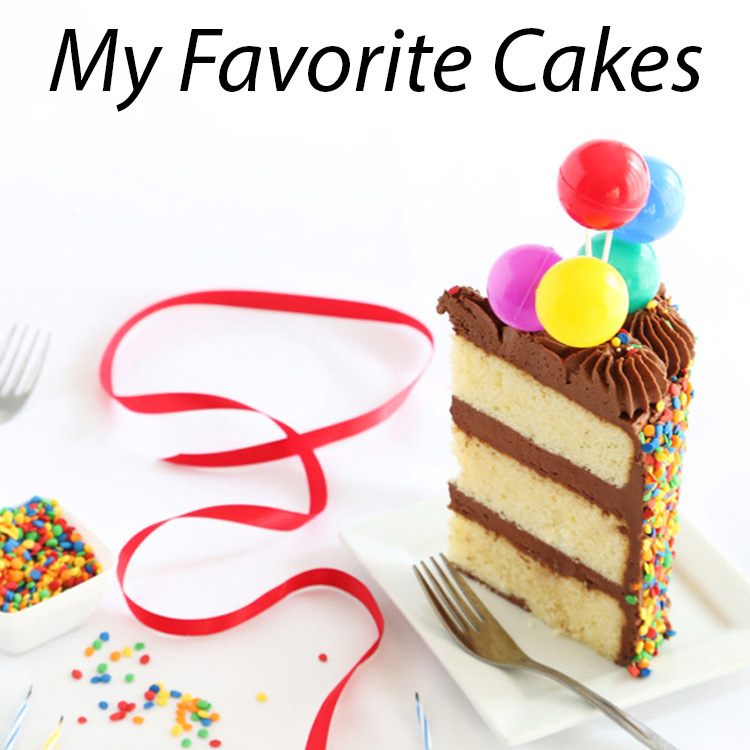 A thick coat hides imperfections better, and in my opinion it makes the cake taste better too. You'll need a couple of special tools, a $5 bench scraper (that is worth many times that, if you ask me) and a cake turntable (or a homemade turntable, as suggested in the video). Email subscribers, click here to watch the video. Did I mention the top tier was made of cheesecake? Friends. 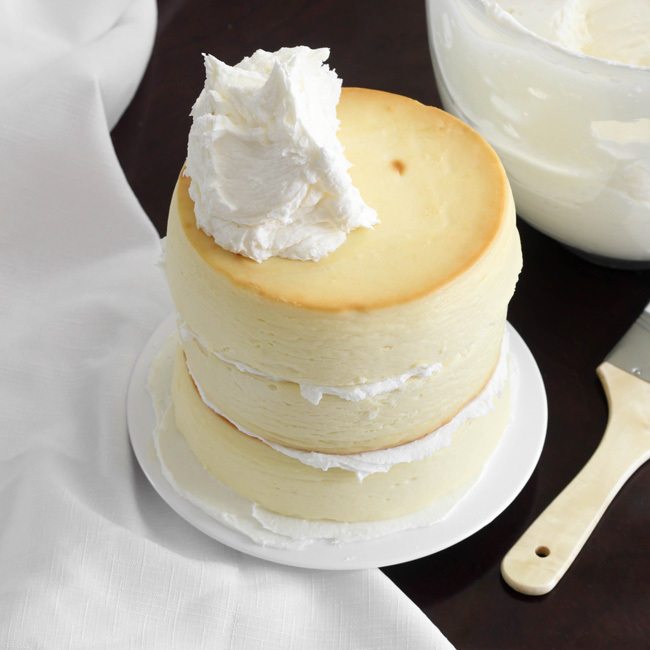 There's a very good reason why wedding cakes are not made of cheesecake. I'd only suggest doing this if you are able to remove the cake from the refrigerator, snap a couple of formal pictures, and then commence the cutting all within 15 minutes. We did not have this luxury, so the cheesecake was very soft. Luckily, the bride got her requested piece, and the remaining cake was whisked off to the refrigerator. 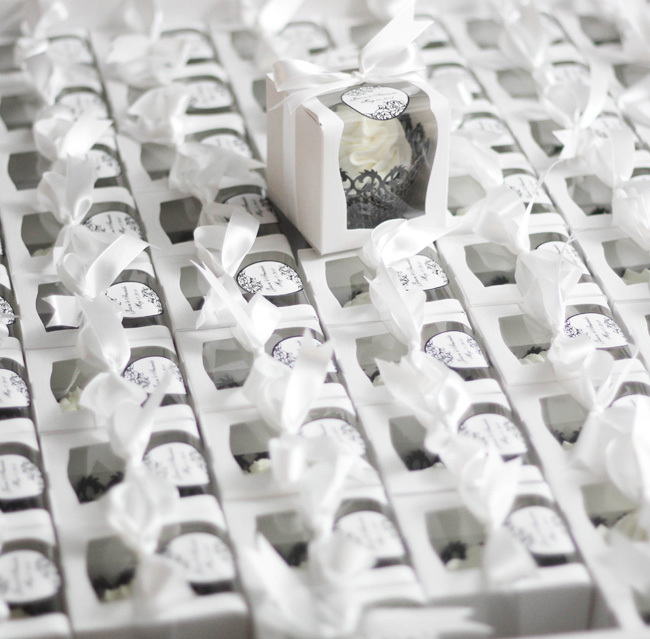 After agreeing to do cupcake favors and also the groom's cake, I realized I'd need some help. My sister-in-law Megan was a real life saver. I think she's recently taken to wearing flip-flops to avoid tying one more bow. 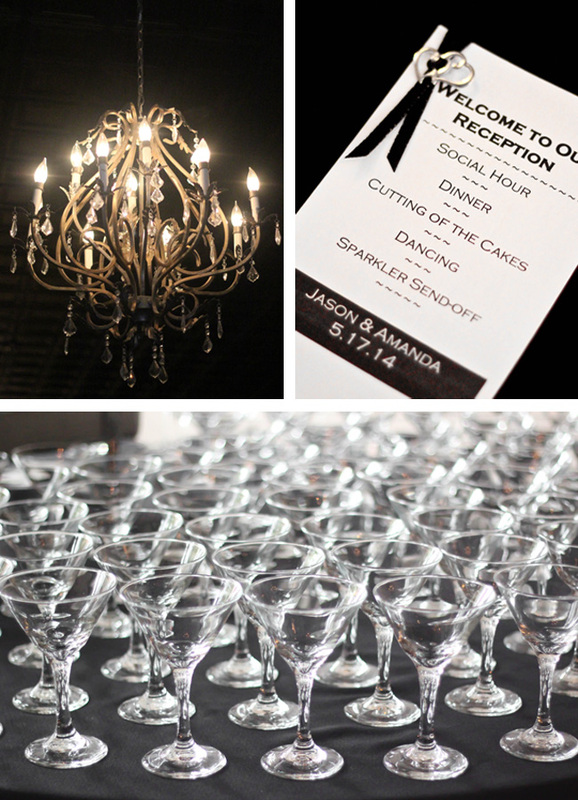 But oh, the favors were pretty! 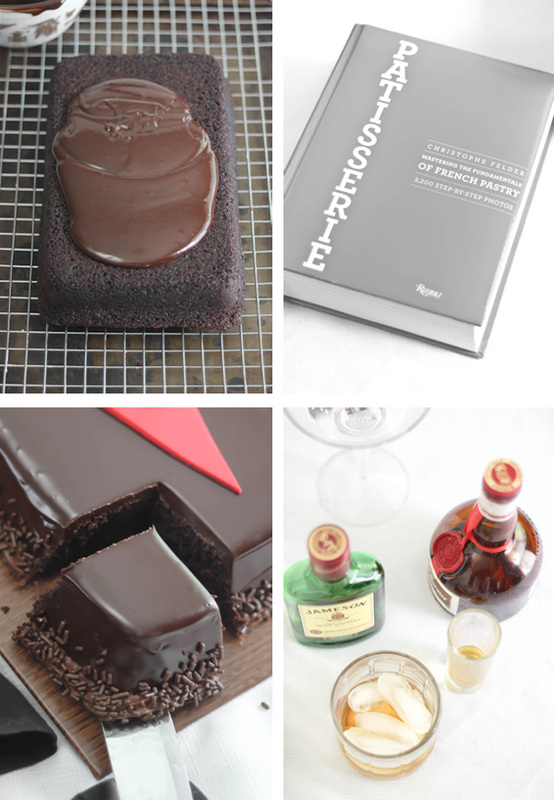 According to The Chocolate Bible, a Gentlemen's Torte is a many-layered Sachertorte that is soaked with booze. Other books on the subject say that almost any cake could be called a Gentlemen's Torte if it is doused with enough whiskey. 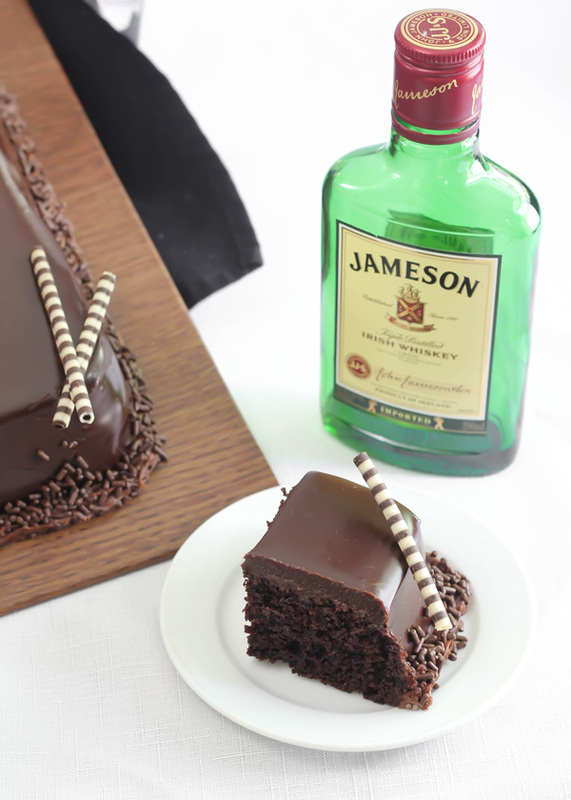 In fairness, I think this type of cake could also be called a Whiskey Women's cake (a book I'm loving, by the way) but with Father's Day fast approaching I was inspired by the masculine title. 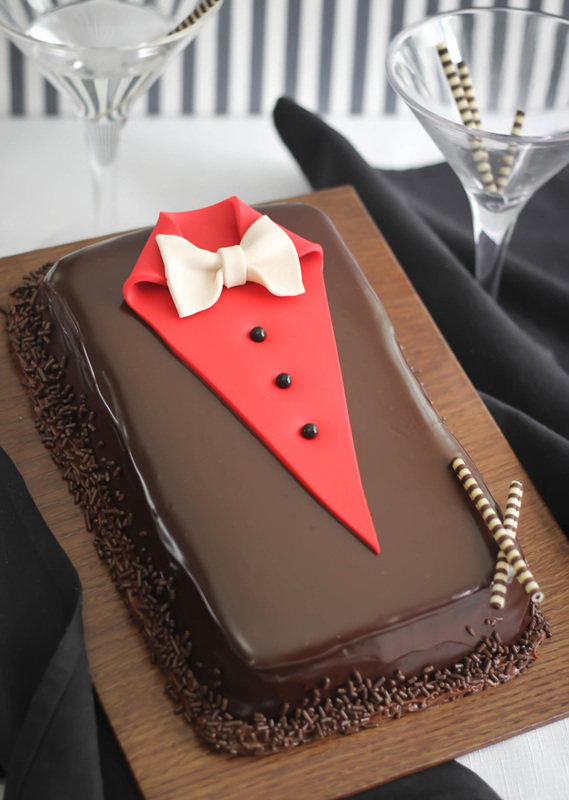 There's nothing wrong with honoring our fine fellows with cake - as long as they share! 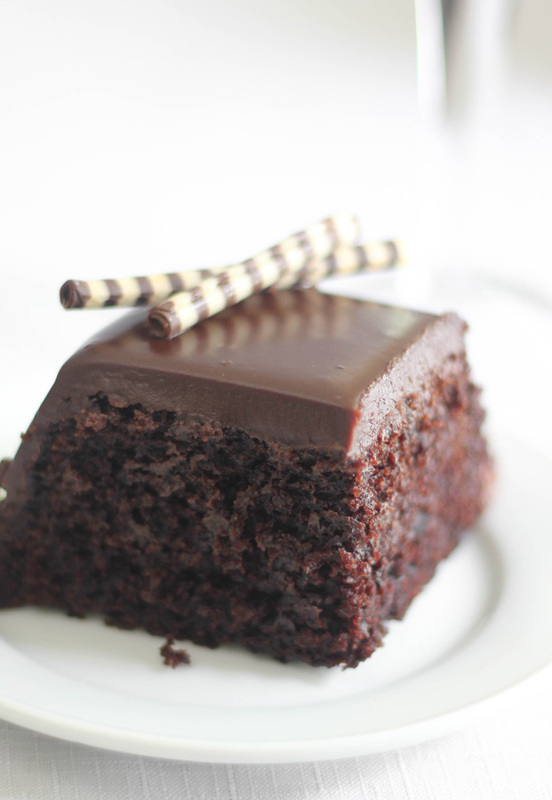 This sheet cake is generously brushed with whiskey and a covering of ganache helps retain a lovely damp crumb. 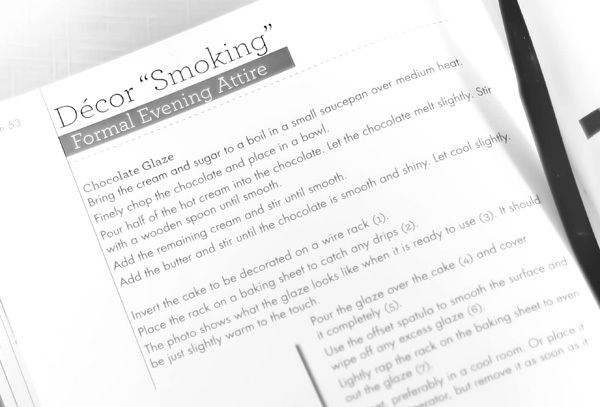 When I spotted the "Décor Smoking" cake decoration tutorial in my new Patisserie book there was no question it had to happen. 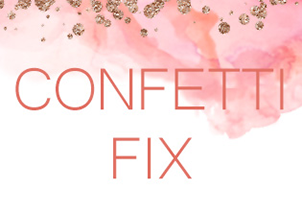 It's as simple as cutting a triangle of fondant and folding in two edges - anyone can do it! I made a little video to show you exactly how easy it is, but I also wanted to show you how to transfer a cake like this from a drip rack to a cake board. Earlier this year someone had asked me how to transfer cakes easily, and here is my advice: chill the cakes before you try to move them and always use a cake lifter. The latter is a marvelous help, but due to it's oversized spatula head it's a pain to store. Believe me, I have two of them and even with the uncomfortable size, I now consider having at least one a necessity. Video note! You'll notice that when I knead the red fondant for the "shirt" portion, I use vegetable shortening to grease the work surface. I also work just a little into the fondant. This may seem strange, but it makes the fondant soft and pliable without making it dry. 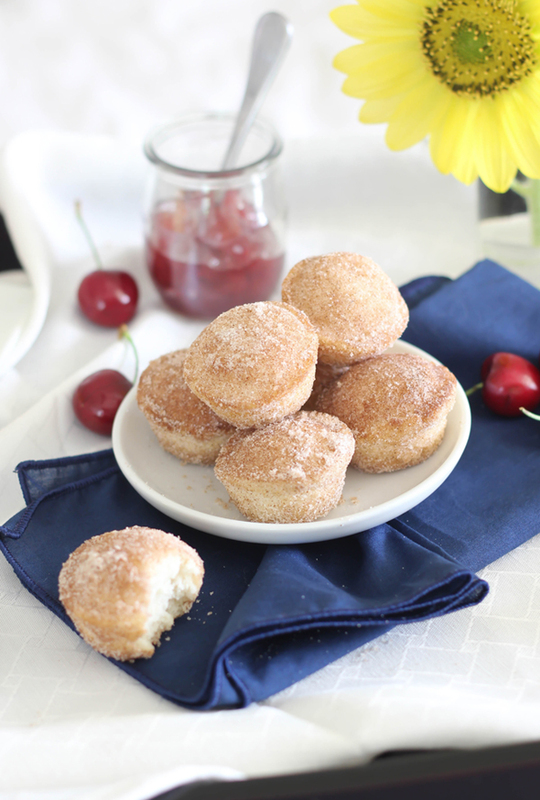 It's not greasy at all, and I highly prefer it over messy powdered sugar and cornstarch. If you're not a fan of fondant, marzipan is a suitable substitute. The chocolate cigarettes on the corner of the cake were an afterthought because - oops! I accidentally grazed it with my wedding ring. I was really sad when that happened because the cake's surface was so perfectly mirrored and shiny. 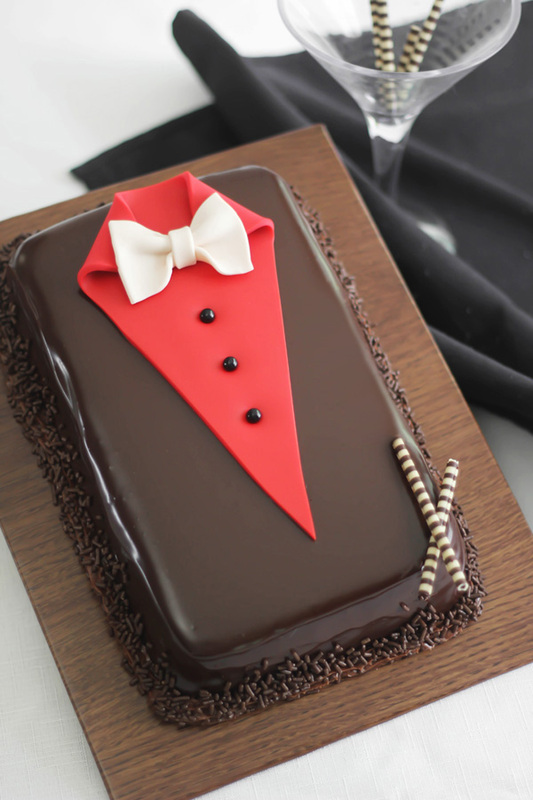 I like them on the cake though, and I think they make sense on a cake dressed as a smoking jacket. Chocolate cigarettes are perhaps the least alarming cigarettes of them all, am I right? I found them at World Market in the baking ingredients section if you're looking to buy them. I'm not ashamed to admit that I ate three pieces of this cake yesterday. It reminds me of a chocolate cake from my favorite Italian restaurant - but better! The whiskey gives it a sophisticated flavor, but it's not overly boozy on the tongue. The fact that it's a sheet cake makes it so simple to whip up, but if you're looking for layers, the batter can be baked in two 9-inch round cake pans. You can find baking times for both versions in the recipe below. Hello June! The first day of summer is still three weeks away, but from where I'm standing -which is squarely in 80 degree weather- it feels like we're already there! I say we give this month a fitting kick-off with a chilly treat. I always associate ice cream sandwiches with summer. And if you ask me, they're made to be enjoyed while sitting outside on the front porch steps, watching the first fireflies. To me, blondies taste like birthday cake but with a different texture. Chewier. 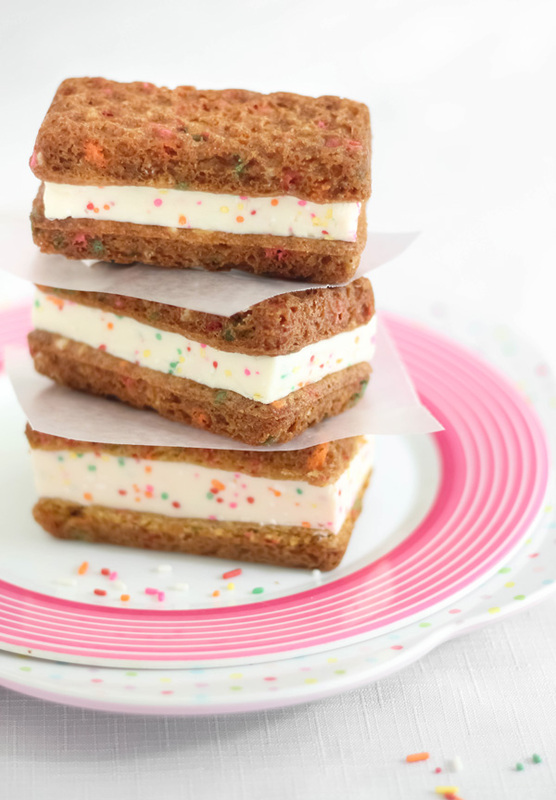 So, these little ice cream sandwiches are like having your birthday cake and ice cream all rolled into one sweet. I can't tell you how many times I've made blondies over the years, but this is the first time I've made them for a blog post - can you believe it? I know! I deserve a proper scolding. 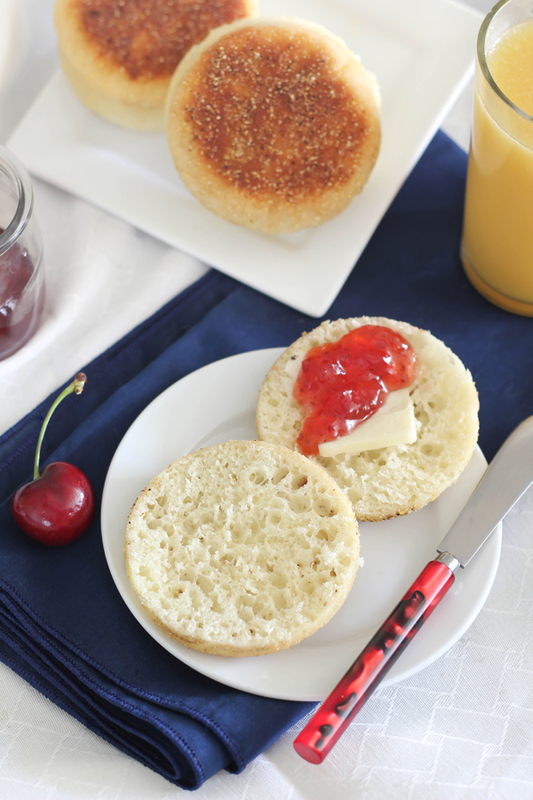 I love how these sandwiches are so uniform, and that's thanks to this super cute pan from Wilton. With it, you can basically turn any cake, brownie, or cookie recipe into shells for sandwiching ice cream. 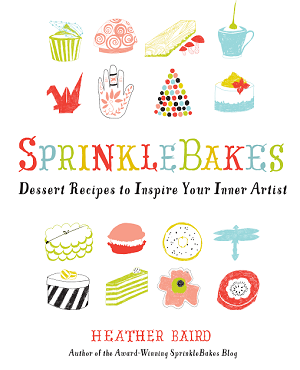 Because I love it so much, we're giving one away, along with a pretty ice cream scoop and a big bottle of multicolor sprinkles! Please read the terms and conditions on the widget for more information. This pan is destined to get a workout in my kitchen this summer. I can't wait to try brownie ice cream sandwiches, or even a no-bake chocolate chip cookie dough version. There are so many possibilities! I'm rather fond of this blondie version, but Wilton has also included two recipes inside the pan's packaging to get you started! 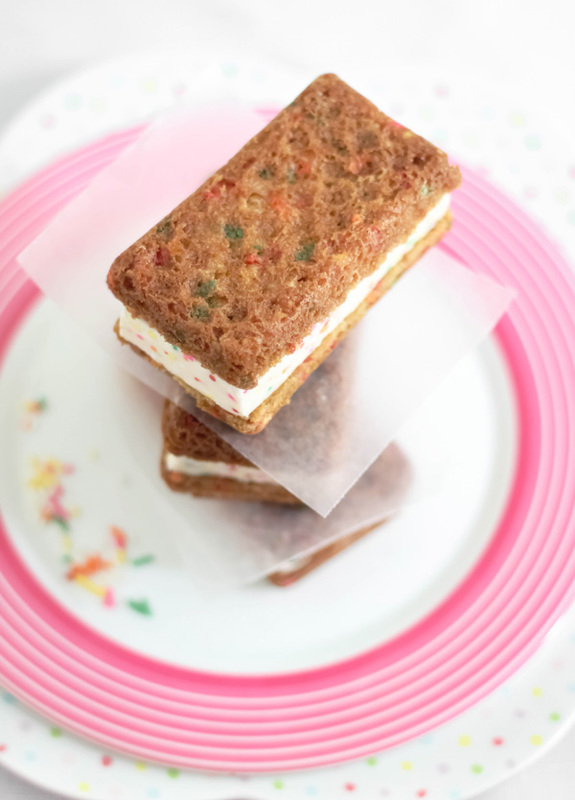 These sandwiches were made using the Wilton Ice Cream Sandwich pan. If you don't have this pan, instructions for using cookie cutters are included. Place the ice cream in a large bowl and fold in the multicolor jimmies. Line a 9x13 baking dish with parchment paper so that two sides of the paper overhang the edges. Pour the ice cream into the dish and freeze until solid, 3-4 hours or overnight. Preheat oven to 325F. 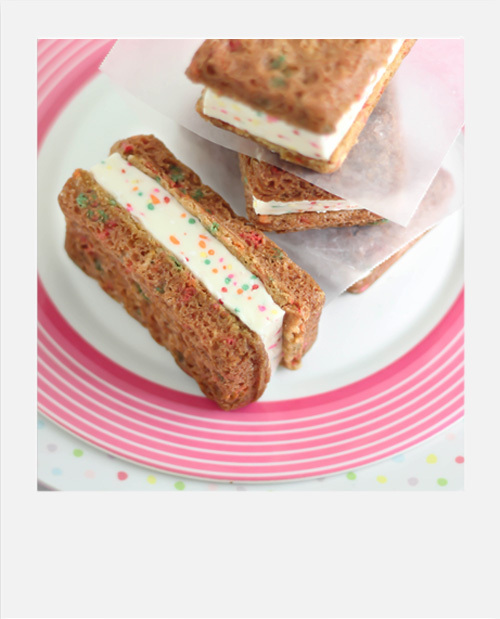 Spray the Wilton ice cream sandwich pan with baking spray with flour (such as Wilton brand Bake Easy! ), or spray a 13x9-inch jelly roll pan with cooking spray and line it with parchment paper, allowing the parchment to overhang two sides. In the bowl of an electric mixer fitted with the paddle attachment, beat the butter on medium-low speed until smooth. Add the brown and granulated sugars, increase the speed to medium and beat until fluffy, about 2 minute, stopping to scrape down the sides occasionally. Add the eggs one at a time, beating well after each addition, then beat in the vanilla, stopping the mixer occasionally to scrape down the bowl. Reduce speed to low, gradually add the flour mixture and beat until just combined. 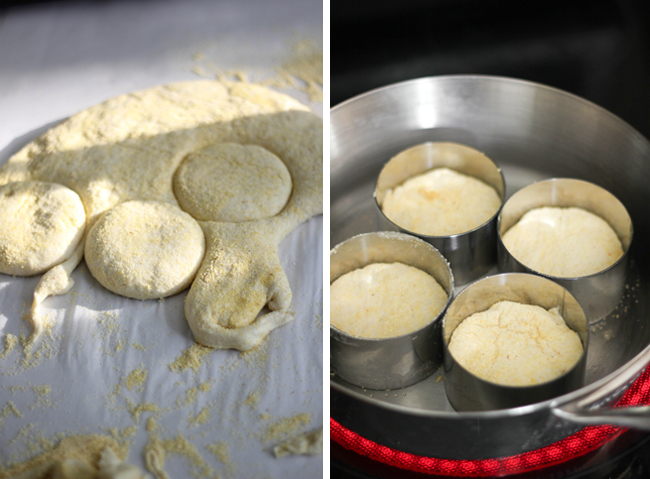 Cover the bowl and refrigerate for two hours or until the dough is stiff. Press 1 1/2 tablespoons batter into each cavity of the ice cream sandwich pan using buttered fingers or a piece of parchment paper sprayed with cooking spray. If not using the ice cream sandwich pan, evenly press the dough so that it just fits into the jelly roll pan. 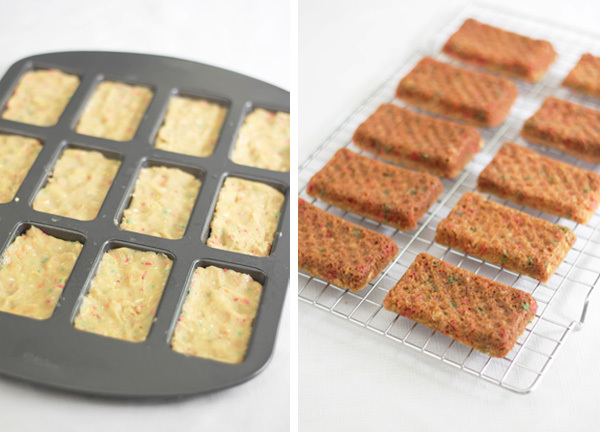 Bake for 13-15 minutes (check the Wilton ice cream sandwich pan at 13 minutes). Transfer the pan to a wire rack to cool. Place a sheet of parchment over a work surface and turn the individual ice cream shells out onto the paper. Allow them to cool completely. If using the 13x9 pan, lift the blondie out of the pan with the two overhanging pieces of parchment. Let cool completely. Cut shapes out of the large blondie sheet using cookie cutters. Remove the ice cream from the pan by lifting it with the two overhanging parchment edges. Working quickly, cut shapes from the ice cream using the same cutters used for the blondies. Sandwich like shapes together. 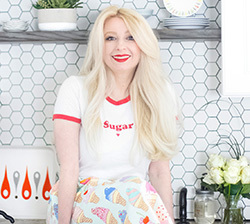 If using the Wilton pan, use a blondie sandwich piece as a template to cut rectangles from the ice cream slab. Use a sharp knife and work quickly! Sandwich the ice cream rectangles between blondie shells. Store sandwiches individually wrapped in wax paper in the freezer.